ITEM #5744: MONTBLANC MONTE ROSA. Black with gold filled trim and Medium steel nib. A real smooth writer. Like writing on glass. To buy please email Pentooling. Be sure to include a shipping address so you can get a cost for shipping. And please make sure that Paypal has your proper shipping address - I use them to generate your shipping label. ITEM #5647: MONTBLANC 146 WITH XFINE ARCHITECT / HEBREW GROUND NIB. This is a grind that can make a wider line horizontally than vertically. This is an MB made after '89 ("GERMANY" on the clip ring, not "W. GERMANY") and before '92 (No S/N on clip ring). ITEM #5730: MONTBLANC GOLD PLATED NOBLESSE BALLPOINT W/ GOLD PLATED TRIM. New old stock. ITEM #5731: MONTBLANC SL-LINE BALLPOINT IN MATTE BURGUNDY. New old stock. ITEM #5726: MONTBLANC SL-LINE MATTE BLACK BALLPOINT NEW OLD STOCK. #2918, gold plated trim. ITEM #5727: MONTBLANC SL-LINE MATTE BLACK PENCIL NEW OLD STOCK #2518, .5mm, , gold plated trim. ITEM #5728: MONTBLANC SL-LINE MATTE BROWN BALLPOINT W/ GOLD PLATED TRIM. NEW OLD STOCK. ITEM #5729: MONTBLANC SL-LINE MATTE BROWN .5mm PENCIL W/ GOLD PLATED TRIM. NEW OLD STOCK. ITEM #5167: MONTBLANC 149 WITH FLEXIBLE NIB. Nib is marked "4810 (M star logo) 14C MONTBLANC 585". Clip ring is marked "GERMANY" and has no serial number. Nib measures Broad on a Parker factory nib grader. (This may be different from European nib grades). 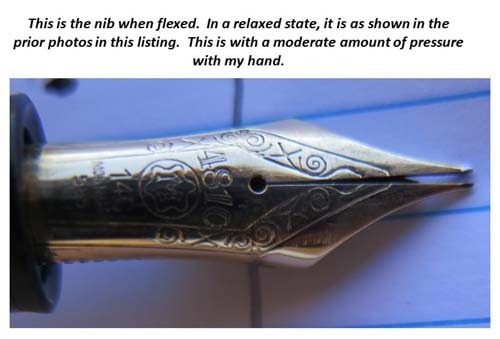 The last photo below demonstrates the flexing of the nib with moderate hand pressure. ITEM #5282: MONTBLANC 164 BALLPOINT IN BLACK. ITEM #5581: MONTBLANC 164 BALLPOINT IN BLACK. ITEM #5512: MONTBLANC 149. Clip ring marked "GERMANY". 18K two tone nib registers Broad on a Parker factory nib gage. European standards may differ. Metal filling unit. ITEM #5417: MONTBLANC 163 ROLLERBALL IN BLACK. ITEM #5735: MONTBLANC VIP FOUNTAIN PEN. NEW OLD STOCK. Manufactured by Montblanc through a partnership with Mutschler, this evolved into the Noblesse line of pens. This is marked "B" on the factory sticker that's still on the pen, and the nib measures Broad on a Parker factory nib grader. This pen has a solid gold nib, marked "585" and it is a silver color. This pen only came in matte black. ITEM #5736: MONTBLANC EARLY NOBLESSE IN STAINLESS. XFine 14K gold nib. New old stock. ITEM #5328: MONTBLANC 2118 EARLY STYLE SL- LINE MATTE BROWN FINISH NOS PEN CA 1987. With Double Broad left foot oblique nib and Montblanc piston converter. Sticker says "OBB". ITEM #5278-82: MONTBLANC 164 BALLPOINT IN BLACK. ITEM #MB CLTH 3.5X7: YOU HAVE THE PEN, BOX, AND PAPERS, BUT DO YOU HAVE THE POLISHING PAD? COMPLETE YOUR CONFIGURATION WITH THE MONTBLANC POLISHING CLOTH. Still in the factory package. 3.5" x 7". ITEM #MB CLTH 9X11: COMPLETE YOUR COLLECTIBLE CONFIGURATION WITH THE MONTBLANC POLISHING CLOTH. Approx 9" X 11". ITEM #5279: MONTBLANC 165 .7mm PENCIL IN BLACK. ITEM #5257: MONTBLANC 163 ROLLERBALL. Black with gold plated trim. ITEM #4175: MONTBLANC SECOND GENERATION NOBLESSE IN MIDNIGHT BLUE LAQUER, ca 1988 NOS. 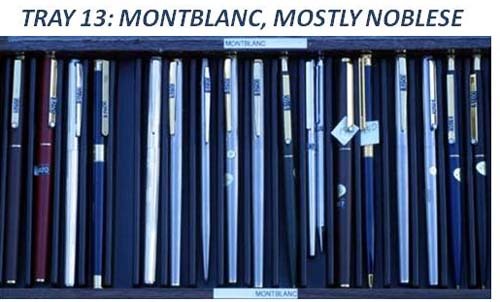 Montblanc catalog #8140. Very smooth writer with a Medium 14 K 585 nib with a lot of fancy scrollwork on it. A Montblanc piston converter is included. ITEM #MB24 EXP: HERE'S A DISASSEMBLED AND DISPLAYED MONTBLANC 24 FOUNTAIN PEN.This was put together by "Mr. C. (Glenn Christensen of The Write Shop, a pen distributor and authorized Montblanc Repair Station whichooperated in Long Beach and Then Garden Grove, California fromn the 50s through the 90s). It's mounted in pieces in an 11 1/2" X 9" frame. You can either hang it on your wall or remove the glue fromn the new old stock repair parts and put together a pen.I believe every part for a MB 24 is here. ITEM #MBSVC: "MONTBLANC SERVICE" stickers. Adhesive backed, 5 1/2 X 3 3/4" oval, foil with globe image in background. A lot of the pens below I haven't had time to list individually, but a some of them have been listed; these are the trays I take to shows. If you see something you want to discuss that you can't find listed under its brand page, send me an email WITH TRAY #, ROW (TOP OR BOTTOM), AND THE PEN's ORDER FROM YOUR LEFT, AND DESCRIPTION. ITEM #3397: MONTBLANC 149. Clip ring marked "GERMANY". 14K fine two tone nib. Metal filling unit. ITEM #3655: MONTBLANC LIMITED EDITION WRITER'S SERIES FRANZ KAFKA BALLPOINT PEN. S/N 09,899 OUT OF 16,500 PRODUCED. DEEP MAROON TRANSLUCENT SQUARE TOPPED CAP. PEN HAS NO KNOWN PROBLEMS, DAMAGE, OR FLAWS. COMES WITH "INTERNATIONAL SERVICE CERTIFICATE" BOOKLET. BACKSIDE OF CLIP SAYS "GERMANY Pix". 14.5 cm LONG, 13.6mm SQUARE AT TOP.COMES WITH BROAD BLUE MONTBLANC Pix FILLER. ITEM #5579: CZAR NIKOLAI 164 SIZED MONTBLANC FOUNTAIN PEN. This is the larger one, 164 sized, 5.555" long (141 mm), capped. Hallmarked vermeil barrel, serial number XI101457 "GERMANY METAL2" engraved in clip ring. Piston filling, of course, with two-tone nib. Without box and papers. ITEM #4090: MONTBLANC 145 CHOPIN FOUNTAIN PEN WITH VERY WIDE NIB. Chrome plated trim. I can't tell if this is a B or a BB; the website with pictures of MB nibs appears to use the same photo for B and BB. But it is .062" wide and there is a sample of what its writing looks like below. S/N cy2041937. Chrome trim. This pen is in like new condition; the person I bought it from received it as a gift and did not like broad nibs. (The 145 hs a threaded cap - the 144 has a pull-off cap). ITEM #5280: MONTBLANC 320 WITH MEDIUM NIB. Comes with Montblanc piston converter. ITEM #5350: MONTBLANC 164R BALLPOINT IN BURGUNDY. S/N KPS06531. ITEM #5158: MONTBLANC BOHEME FOUNTAIN PEN WITH RETRACTABLE 14K RHODIUM COATED BROAD OBLIQUE NIB. 8 faceted synthetic noir onyx stone in clip. New condition with perfect presentation box and cardboard sleve. A beautifully done safety pen with flip-top cartridge compartment. Uses short International cartridges (no converter). S/N EZ1099257. I'm not going too engage in the banter as to whether this is a Left or Right Oblique; suffice it to say that is looks like your left foot (approx. 4 degrees) and then take a look at the photos and call it as you wish. This item has all the cleverness of a Waterman 42, the Rube Goldberness of a Sheaffer Snorkel, and the intricacy of a Namiki Vanishing Point. Fun just to hold and play with. A well done piece of hardware. A great writer and a pleasure to use. Comes with original sales receipt from 2006. ITEM #5465: MONTBLANC 165R PENCIL IN BURGUNDY. Twist action mechanism uses .028" (.7mm) leads. 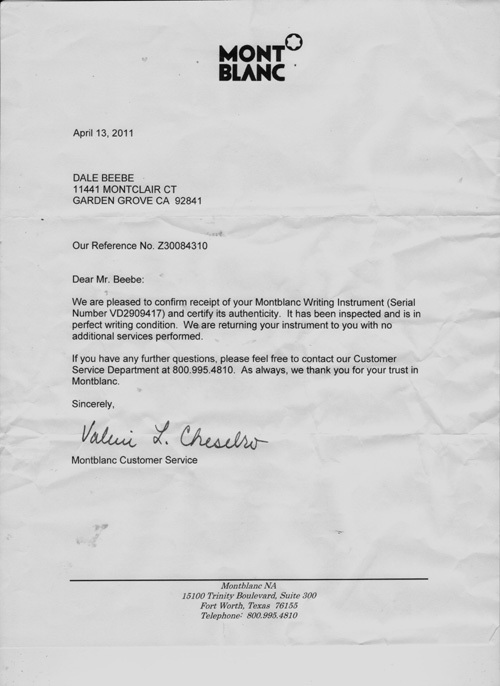 ITEM #4940: MONTBLANC CARTRIDGE FILLING CARRERA. Brushed stainless barrel with matte black cap and brushed chrome plated trim. Includes Montblanc piston converter. ITEM #5327: MONTBLANC 2118 EARLY STYLE SL- LINE BRUSHED STAINLESS FINISH NOS PEN ca 1987. Fine Montblanc nib and piston converter included. ITEM #5418: MONTBLANC 2118 EARLY STYLE SL- LINE GUN METAL GREY FOUNTAIN PEN. Smooth Broad nib. Pen is unused, but there is some shelf wear on the gun metal grey finish. Not very noticable, but it does show up in the photos below. Includes a Montblanc piston converter. ITEM #4274: MB 144R BURGUNDY FOUNTAIN PEN. Medium two-tone nib. Near mint condition. Comes with MB piston convertor. No scratches, dings, dents or cracks. To buy please email Pentooling.To buy please email Pentooling.Be sure and provide a shipping address that the US Postal Service will accept. If you're outside the US,try your address on Google Earth. If they can find it, it is probable that the USPS will accept it. ITEM #3420: MONTBLANC 2118 EARLY STYLE SL- LINE MATTE RED FINISH NEW OLD STOCK FOUNTAIN PEN ca 1987. Fine nib with piston filling converter included. ITEM #4033: MONTBLANC MODEL 320P CARTRIDGE FILLER WITH CONVERTOR. Extra Fine ("XF", like the gold sticker on the barrel says) 14K nib. This unit tests out @ .9cc capacity. This is, depending on the year of the catalog you look at, part of either the Masterpiece collection (1979 catalog) or the Classic line (1986 catalog). ITEM #5287: MONTBLANC 32 WITH MEDIUM NIB. Piston filler. ITEM #3900: MONTBLANC BLACK FINELINER STAR WALKER ROLLERBALL S/N VD2909417. This pen is new, having been purchased from a gift recipient who would rather have the money. I've sent this to Montblanc and had it verified as authentic Montblanc and in "Perfect Writing Condition" - see the last photo for a copy of this authentication. ITEM #5026: MONTBLANC 164R BURGUNDY BALLPOINT. "GERMANY" on back of clip ring. ITEM #4935: MONTBLANC 164R BURGUNDY BALLPOINT. "W-GERMANY" on back of clip ring. ITEM #4034: 16 PAGE MONTBLANC HEMINGWAY SALES BROCHURE, MINT CONDITION. 7 3/4" X 3 1/2"
ITEM #3397: MONTBLANC 149 IN NEAR MINT CONDITION. NEW OLD STOCK, 1985 TO 1988. The nib is marked "14K", Is two tone with narrow shoulders (.380" wide). The point is at the high end of MEDIUM on a Parker factory nib grader. ITEM #4755: MONTBLANC 149. Semi-flexible two-tone 14K nib measures Medium on a Parker factory nib grader (This may be considered Fine in a European context) and measures .397" wide @ shoulders. brass filling unit. The back of the clip ring is inscribed "W.- Germany". This was marketed before the days of assigning serial numbers. The condition of this pen is approaching new. I purchased it in a collection of 93 pens owned by an elderly gentleman who started buying in the '60s and only bought new pens. So we have a single user spreading his usage among 93 pens during a 54 year period. And about half that time he was retired. No nicks, chips, dents or visible scratches or brassing. Piston filled, of course. The former owner stored this collection on trays with Q-Tips between the pens. ITEM #4176: MONTBLANC #2118 BROWN SL- LINE. With Fine, close to Medium "MONTBLANC" nib as measured on Parker factory nib gage. 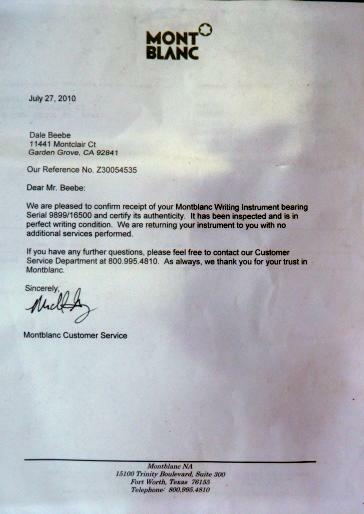 Montblanc labelled it "M". Ca. 1982 New Old Stock. ITEM #4939: MONTBLANC CARRERA PISTON FILLER, NEW OLD STOCK, IN ORANGE and BLACK W/ CHROME PLATED TRIM. Nib measures Broad on a Parker factory nib grader. ITEM #4142: MONTBLANC MONTE ROSA IN NEAR MINT CONDITION. Piston filler with MEDIUM nib. No brassing with a very clean, clear ink view section. ITEM #4718: MONTBLANC MASTERPIECE BALLPOINT. Twist action, black w/ gold plated trim. ITEM #4003: MONTBLANC 163 ROLLERBALL S/N EG1174883. This piece has a new cap shell from an inventory of Montblanc repair parts from an authorized repair station inventory. ITEM #4152: MONTBLANC 149 IN NEAR MINT CONDITION. Two-tone nib is marked "14k", it has broad shoulders (.395"), 1985-88, The tip is above BROAD on a Parker factory nib grader. ITEM #4482: MONTBLANC BLACK 163 CLASSIQUE ROLLERBALL S/N EB116147. ITEM #4517: MONTBLANC MASTERPIECE 146. Features a super smooth, slightly flexible broad monotone nib. No scratches in the resin or brassing on the gold plated trim. ITEM #3399: MONTBLANC 149 IN NEAR MINT CONDITION. The nib is marked "18K". It is two-toned with broad (.404") shoulders. 1991-94. The tip is at mid range BROAD on a Parker factory nib grader. ITEM #4089: MONTBLANC 164 BALLPOINT. S/N BP1231063. Outfitted with black medium filler. Gold filled trim. ITEM #4153: MONTBLANC 149 IN NEAR MINT CONDITION - LIKE NEW. Three-tone FLEXIBLE nib is marked "14C" and has broad shoulders (.400"). 1960s-70s. The tip is at the top end of the BROAD scale on a Parker factory nib grader. This is a beautiful pen in near perfect condition. ITEM #4344: MONTBLANC 144 FOUNTAIN PEN. BROAD / MEDIUM nib (right on the boundary between BROAD & MEDIUM on a Parker factory nib grader). Cartridge / convertor filling. Comes with a piston convertor. S/N ID115052. No known or visible flaws. Like a new pen. ITEM #3980: MONTBLANC 146 DESK BASE & SOCKET. Good plating. 4 3/4" X 3 1/8" X 55/64". The pen shown in the pictures is not included. ITEM #3970: MONTBLANC 149. Fine nib, near mint condition, S/N EB109527. This pen has been tested for capacity and has been found to take in 1.4 cc of ink. Metal filling unit threads. The two-tone nib is marked "4810" "M" in a snowcap shaped circle, "18K", "MONTBLANC", "750", and an oval shaped insignia that has 5 characters in it, the most legible 3 being "Sle O D", with a slash across the "O". I don't see this oval hallmark on most other Montblanc nibs in pens in my inventory. A nice big pen at a great price. ITEM #4272: MONTBLANC 164R RED BALLPOINT. GOLD PLATED TRIM. No scratches, dings, dents or cracks. Near mint condition. ITEM #4273: MONTBLANC 164R RED BALLPOINT. GOLD PLATED TRIM. No scratches, dings, dents or cracks. Near mint condition. ITEM #3398: NEW OLD STOCK MONTBLANC 149 FOUNTAIN PEN FROM THE 90s. WAS PURCHASED WITH THE INVENTORY OF AN OLD FOUNTAIN PEN SHOP AS PARTS PURCHASED IN '97. NO BOXES, PAPERS, OR S/N. IT HAS METAL THREADS ON THE FILLING UNIT (AS OPPOSED TO PLASTIC) AND THE FINE NIB IS INSCRIBED WITH THE SIX POINTED STAR LOGO AND "4810 14K MONTBLANC 585". NEVER INKED. Not returnable if dipped or filled. ITEM #4044: MONTBLANC HEMMINGWAY UNUSED 11" X 8" POINT OF SALE COUNTER STAND-UP AD. The fold-out prop on the back has never been folded out. Mint condition. ITEM #3678: MONTBLANC 146 GOLD PLATED FOUNTAIN PEN. Barleycorn pattern in near mint condition. No known flaws. This pen has been gone over & refurbished at Montblanc by Montblanc. Paperwork / receipt for this work will be included with the pen. This is West German made, approx. 70's vintage, with metal threads on the filling system rather than plastic as is used today. This pen was made before MB started using serial numbers. Montblanc has verified the authenticity of this pen. That documentation is included with the pen. No dings or dents. ITEM #3709: MONTBLANC 164R BALLPOINT. Medium blue filler. Maroon body. "GERMANY" on back of clip ring, S/N CD202891. ITEM #3710:MONTBLANC 163 ROLLERBALL S/N HC123600. Fine blue filler, black barrel & cap.